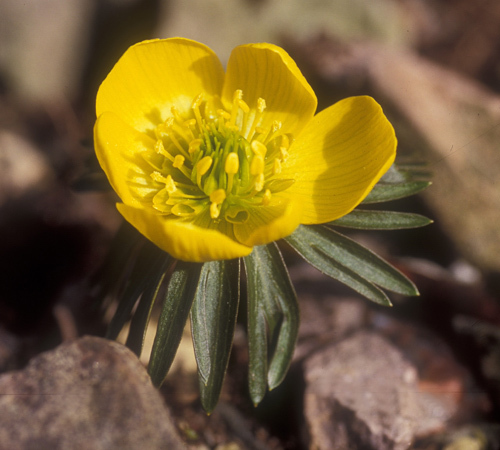 Eranthis ( Ranunculaceae) is a family of perennials with tuberous rhizomes, which flower from winter to early spring. They light up these dark days with an almost luminous yellow, which associates well with snowdrops. Three main species seem to be commonly grown in our gardens, - E, cilicia, E. hyemalis, and a hybrid, garden-bred from these two, E. x tubergenii..
Eranthis cilicia is found in Turkey, Iraq, and Afghanistan. In its native habitat, it flowers soon after snow melt in Alpine pastures, mountain slopes and woodland margins. In cultivation it is the most difficult to grow, needing more sun, and a drying period in summer. 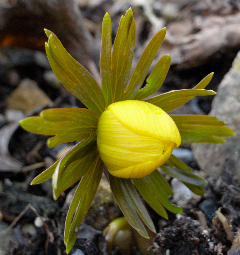 Eranthis hyemalis, the common winter aconite, is native to Southern Europe, and has naturalised across much of western Europe, including Britain. It grows in rocky places and woodland, and is entirely hardy. A garden cultivar bred from E. x tubergenii is named "Guinea Gold", which is the plant illustrated in this article. It is hardier than E cilicia, and with the biggest flower. Paul Christian, of Rareplants, finds that these varieties of Eranthis do well in the garden in limey and peaty soils, as long as they have light shade, water and good drainage. Brian Mathew, however, suggests that they are particularly good in soils that tend towards the alkaline. 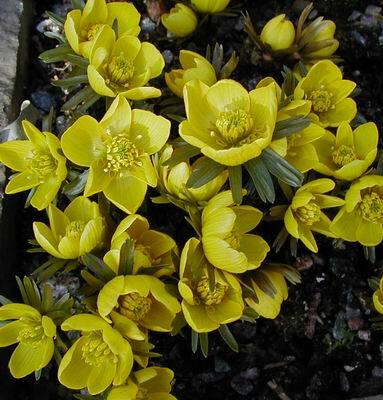 I grow Eranthis hyemalis in the light shade of woodland, and Eranthis tubergenii "Guinea Gold" in the rockery, where it gets the afternoon sun. They can all be temperamental. The tubers can take a year's "sabbatical", presumably to refresh themselves, and to reappear the next spring as bright as ever. Because E. tubergenii "Guinea Gold" flowers later in the spring, I get a constant flash of gold during most of January until mid March.